The Flesheater™ Military Bolo fills the niche between the heavy duty Flesheater™ 5 Utility Bolo and the original Flesheater. Providing a strong yet lighter weight bolo design, this variation combines the cutting and chopping capabilities of the FE5 with the versatile handle configuration of the original Flesheater. As with the FE5, the utility bolo incorporates a half-tapered tang to aid in dampening the shock harmonics through the handle during extreme use. The Flesheater 5 comes standard with a 440-C stainless blade, but may also be ordered in CPM 154-CM for the best combined working properties with stainless characteristics, or in CPM 3V tool steel for ultimate toughness. 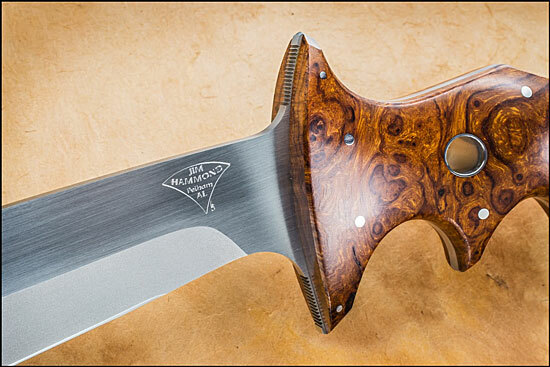 NOTE: The particular Military Bolo shown in the photographs is not the standard model but a custom variation having a presentation grade Desert Ironwood handle, a hand-rubbed satin ricasso on the blade with bead-blast bevels and a hand-rubbed satin finish around the perimeter of the knife. 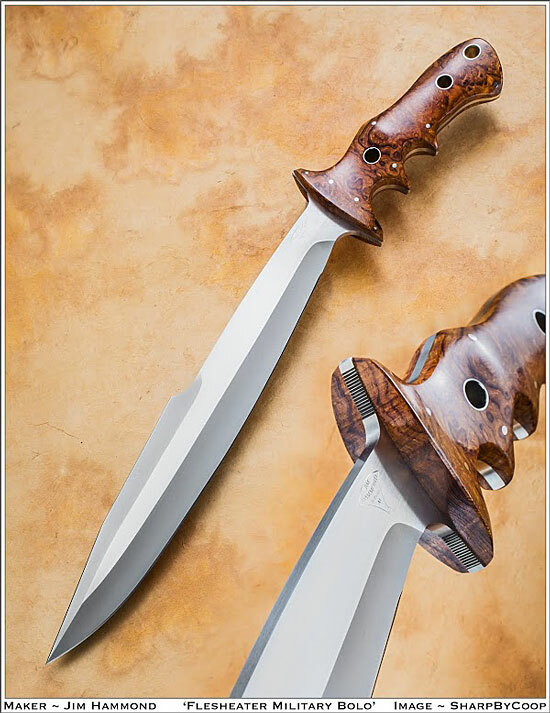 The actual appearance for the standard Military Bolo, having a bead blast blade with black linen micarta scales, can be seen on the Flesheater 5 Bolo. 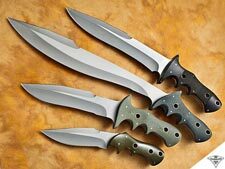 *ACTIVE MILITARY PERSONNEL: Please contact Jim Hammond Knives for special military pricing.